I’ve added a link to Andrew Sullivan’s Daily Dish blog at The Atlantic. 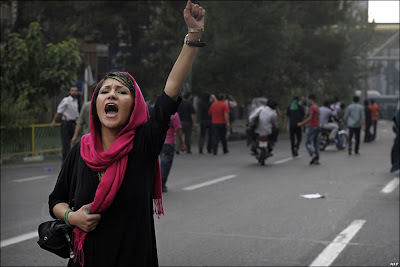 He and others there have been liveblogging the events unfolding in Iran. Very valuable source of information. Kansas physician George Tiller, long renowned for being one of the nation’s handful of late-term (and partial-birth) abortion providers, was shot and killed in a Wichita church Sunday, when a lone gunman entered the building and fired a single bullet from a handgun at him. Arrested for the crime was one Scott Roeder, who, as far as I am currently aware, is now in the Sedgewick County jail awaiting charges. Leave aside for the moment the rather obvious problems tenant to simultaneously calling oneself “pro-life” and rejoicing (either publicly or privately) at the vigilante execution of a human being. The far-reaching result of Tiller’s killing (above and beyond the grief and loss his family is undegoing) will be to re-polarize the abortion debate, drastically narrowing the common ground spoken of by the president at his recent commencement address at Notre Dame University. Absent in almost all rhetoric in the abortion debate is the recognition that people of good faith exist on both opposing sides. The inability to empathize with the other side is what leads to events like Sunday’s slaying of Tiller in his place of worship — the idea that the opposing side consists solely of evil-minded people who want to either murder babies or strip women of their reproductive rights. This works well for the purposes of preaching to the proverbial choir, and little else — unless, of course, you count inciting deranged psychopaths to take their twisted personal sense of justice into their own hands.